Happyhostel i Budapest, Ungarn: Bestill nå! Cancellation policy is 1 month before arrival!After that full amount of accomodation need to be pay. Sports,Stag and Hen groups are welcome!This group types can be ask for deposite payment on arrival or in advanve!The deposite is refundable and of the trip if all places are handle back as it was on arrival time. Happyflat is a really cool, cozy and affordable hostel with private rooms right in the city center of Budapest. Its strongest point is location. Hostel is situated in the real city center of Budapest. Best of all, taxi and public transport are not necessary to reach any of the major historical sites or tourist attractions. 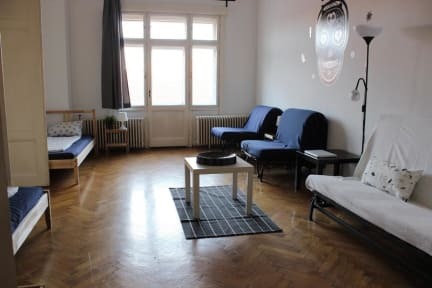 Due to our special location our hostel is right in the middle of the nightlife of Budapest and at the same time the rooms are protected from the noise of the streets which provides ideal circumstances for sleeping or chilling out. We are just footsteps away from the pulsating city center, so bars, pubs, party places, open summer clubs and restaurants are on our doorstep, so you can enjoy your time here without restraint. It’s definitely one of the best youth hostels in Budapest. The Varoshaz Street is one of Budapest's most intimate streets that provides a feeling of cosy home and European metropolis at same time. Breakfast can be ordered on-demand at Coffee Bali restaurant across the street 1 minute from Happyflat. At cafe Bali we provide a free glass of beer or hot wine for our guests and 10% discount from bill at any time you eat there! Shopping Guide to the best buys in Budapest. Our totally furnished rooms, flats are side-by-side, accommodating a total of 48 guests. Each room is 6 meters high, so there is an extra floor for your comfort. Internet is accessible in all flats. All different kind of beds (king-size, double, singles, and bunk beds) making your staying comfortable! All rooms, flats are well equipped from the small hairdryer, iron...up to the w.machine free to use! All room has it own kitchen, toilet and bathroom to feel at home! The staff is ready at any time of a day 0-24 to help you out with any question you have and try to make our life easier, safer and happier in your time you in this great city! Recommendation of programs, excursions, restaurants, concerts, and all venues in Budapest. Upon request, tickets and restaurant reservations, and guided city-sightseeing tours can be arranged. If you want to attend the best parties in Budapest, we know where to find them; house, electro, jazz etc. Superb, professional Dental Services in the apartment building.